1/5/2009Share this story on Facebook! MLK scholar L-Greta Hardware '09 enjoys volunteering as a "big sister." To qualify for the Ithaca Leadership Scholarship, students must rank in the top 30 percent of their high school class and have a combined SAT score of at least 1100 (out of 1600, critical reading and math). Students are judged based on those criteria as well as on the extent of their leadership involvement. Applicants are required to submit additional recommendations and essays that reflect their experiences as leaders. The scholarship is offered to up to 60 incoming students each year. Applications are due by January 15, and decisions are usually sent out in late March or early April. Once awarded the scholarship, students attend an orientation during the first month of the fall semester to learn of the requirements and how to maintain the scholarship. The scholars use their portfolios to demonstrate their adherence to the requirements as well as their overall leadership experience. The Martin Luther King Jr. Scholar Program is open to academically talented students from ethnic and racial backgrounds that have been historically underrepresented in American higher education. Scholars receive up to full tuition in aid every year, with a minimum merit-based scholarship of $18,000. Scholars must maintain a B+ average, participate in community service each semester, live in the HOME program, travel annually, complete a three-year research project, produce a portfolio reflecting on their experience, and participate in all required programs. Qualified applicants for the Park Scholar Award are high school seniors who have achieved a high level of academic achievement, are involved in extracurricular activities, and have a passion for community service. The application process begins in January with an application and essays, recommendations, a transcript, and a résumé. Finalists are notified in March and are then invited to finalist weekend. Finalist weekend involves a series of on-campus activities and interviews over the course of a four-day visit during in which finalists stay with a current Park scholar. Award recipients are notified in April. Applicants for the rising junior Park Scholar Award must complete an application and interview process in their sophomore year and enter the program as juniors. To be eligible, students must have completed three semesters as full-time students in the Park School, have a cumulative GPA of at least 3.5, and demonstrate academic excellence, strong leadership skills, extracurricular involvement, and a dedication to community service. The award is a renewable scholarship that students maintain by adhering to the standards and requirements of the program. Students must attend three leadership sessions per semester through the Student Leadership Institute, participate in a service project, and maintain a portfolio that reflects their leadership experience. Leadership scholar Jason Barrera '11 takes a YouTube break with Shaina Ung '11 in his room in Boothroyd Hall. The scholarship puts great emphasis on the individual leadership journeys of the scholars. Students can select which leadership sessions to attend based on their interests and motives, an option that provides flexibility and diversity in the program. “There are tons of student leadership workshops to choose from that can challenge your thinking about leadership and help you develop your own personal style,” said leadership scholar Samantha Wolfe ’11. Scholars often get passionate about their service projects. Some students choose on-campus service projects such as food drives, cleanups days, and fund-raising for charitable clubs, while others support larger causes such as Big Brothers Big Sisters, Habitat for Humanity, and the SPCA. Scholar Shari Kaplan ’11 has benefited greatly from the program. “It has encouraged me to become a more informed community member and has made me examine myself, what I have achieved, and what my goals are for the future,” she explains. Program director Michelle Lenhart puts great emphasis on the idea that leadership is not a position but a process. The goal-oriented program encourages students follow a plan to guide them through their college journey to strengthen their skills and become practiced and effective leaders. Martin Luther King Jr. Scholar Program: The Ithaca College Martin Luther King Jr. Scholar Program graduated its inaugural class of just eight students in spring 2006. Today, it has over 30 scholars. This ambitious program was started as a way for students to be radical agents for social change by building the skills and perspectives to carry out King’s message of nonviolence and perseverance. The program has blossomed from its humble beginnings and has reached far beyond the Ithaca College campus. In the greater Ithaca community, MLK scholars continue to make an impact through community involvement and service. Scholars are global citizens, which means that they are called to look beyond their immediate point of reference and make cross-cultural connections in the spirit of scholarship, diplomacy, and brotherhood; to act in peace, justice, and understanding wherever they may travel; and to foster intellectual and spiritual growth. 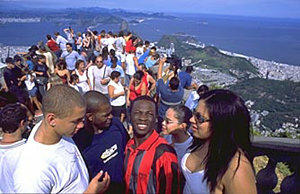 MLK scholars (foreground) pose for a photo while visiting Brazil. Scholars travel outside the United States for a full week each year to research issues of social justice in different cultures. Scholars have traveled to such locations as Brazil, Spain, Morocco, South Korea, London, and Costa Rica. First-year scholars participate in the civil rights tour, a moving and in-depth experience of the civil rights movement that takes students to its southern origins. Upperclassmen in the program present a three-year research project at the James Whalen Academic Symposium. Their projects also include a portfolio in which they describe their perspectives on social justice as developed by international travel. Two scholars have gone on to develop the presentation project into Fulbright Scholarship work. “Once you are an MLK scholar you carry the same spirit of social justice and passion for learning and leadership into whatever you choose to do after you leave this campus,” says Fred Chandra ’06. Park Scholar Program: The Park Scholar Program at Ithaca College is one of few scholarship programs of its kind in the country. Made possible by the generosity of the Park Foundation, each Park Scholar Award covers the full cost of attendance at Ithaca College -- tuition, room and board, books, a stipend for living expenses, and a one-time computer purchase of up to $2,500. Up to 15 of these merit-based awards are given to incoming freshman each year, and in 2008 the Park Scholar Program introduced its rising junior awards to give current Park School students an opportunity to be recognized for their outstanding achievements. Park scholars meet with former assistant secretary of state for public affairs James Rubin and CNN chief international correspondent Christiane Amanpour. The Park Scholar Program isn’t just a scholarship -- it’s a learning community. Park scholars come together to participate in a variety of community service partnerships and educational experiences including book reviews, symposiums, and receptions with guests speakers such as Christiane Amanpour and Tom Wolfe. While at IC, Park scholars are challenged to maintain a 3.5 GPA, engage in community service, and remain in good judicial standing. First-year scholars live in the HOME program, a residential learning community on campus that explores multicultural issues, and participate in the first-year seminar. Over fall break, junior scholars travel to New York City on a job-shadowing trip. 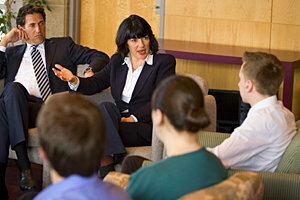 Scholars from every class year are given the opportunity to participate in a unique faculty mentor program through which students work one-on-one with a professor on a research project or creative work. Many scholars have also had fulfilling experiences abroad. Whether it be interning with NBC during the Olympics Games, conducting research in South Africa, studying and interning in London or L.A., or volunteering in Addis Ababa, Ethiopia, scholars are making a big impact abroad.